This weekend was spent making over our kitchen floor, which as you can see, started off pretty grim when we moved in a little over a month ago. The old floor tile felt dirty on our feet and no matter how many times we mopped it, it still remained a lovely shade of stained, yellow-ish blue. Not cute. 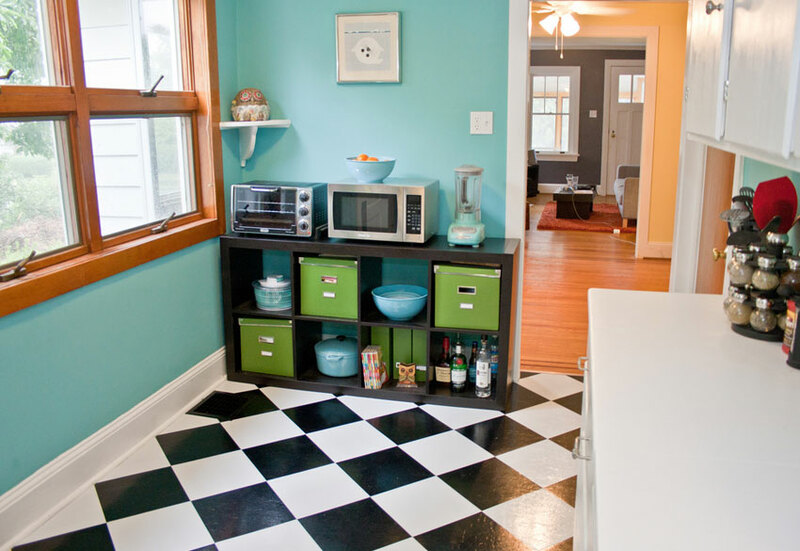 We decided to shop around for affordable peel and stick, vinyl tiles in black and white. 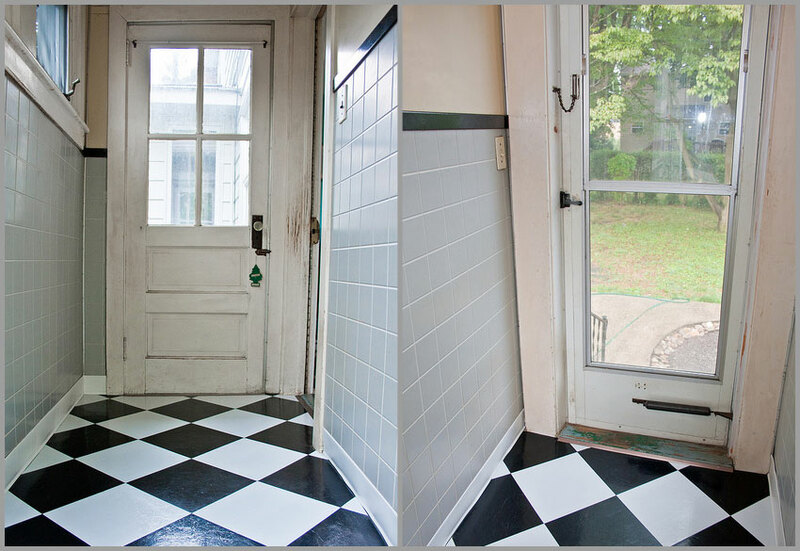 We were surprised when we found out both Home Depot and Lowe’s did not sell simple black and white, vinyl stick-on tiles. I called several tile distributors in the area and got a lot of “Ha, are you serious? 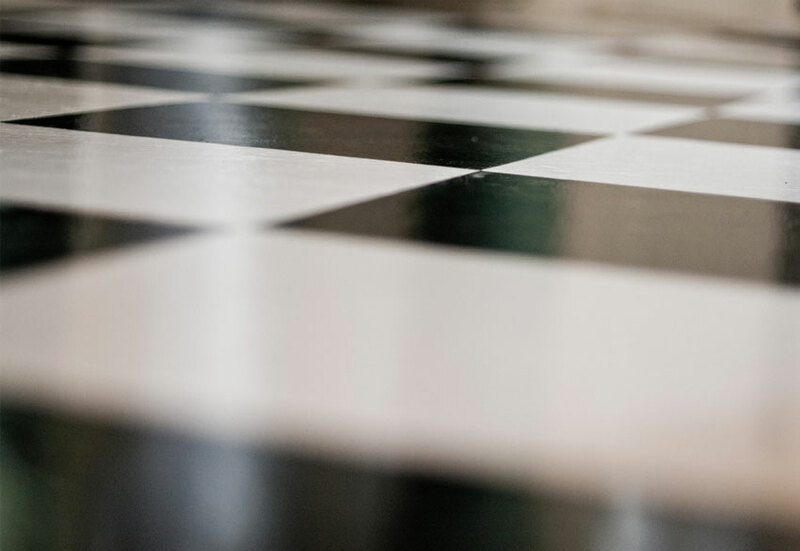 I haven’t seen a checkerboard floor since the 80’s” responses. Uhh, obviously these people don’t browse Pinterest on a regular basis. I ended up finding a wholesale tile distributor in New Jersey called Mazer Wholesale, where they sell packs of 20 white or black tiles for $7/piece with a 5-year warranty. Yes, please! 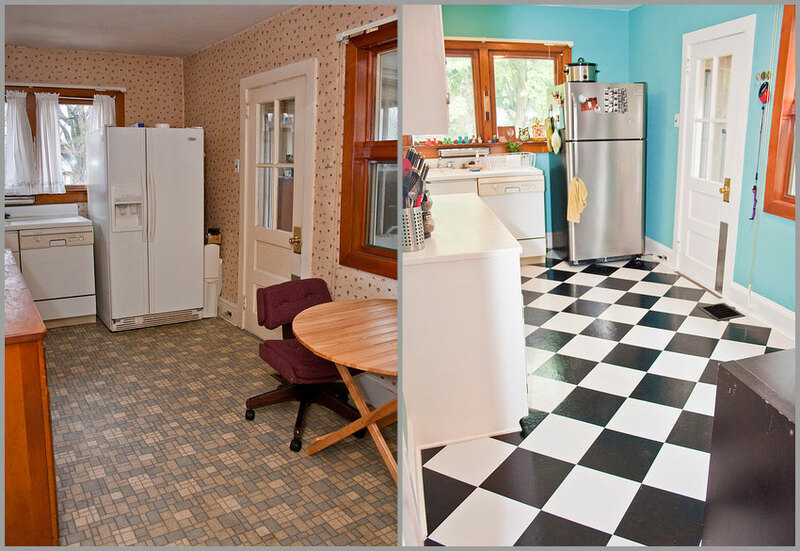 We were able to give our floors a new look for under $100 in just one weekend, so I think it was definitely worth it. The tiles arrived just two days after my order was placed, so I couldn’t have been more happy with the shopping experience. 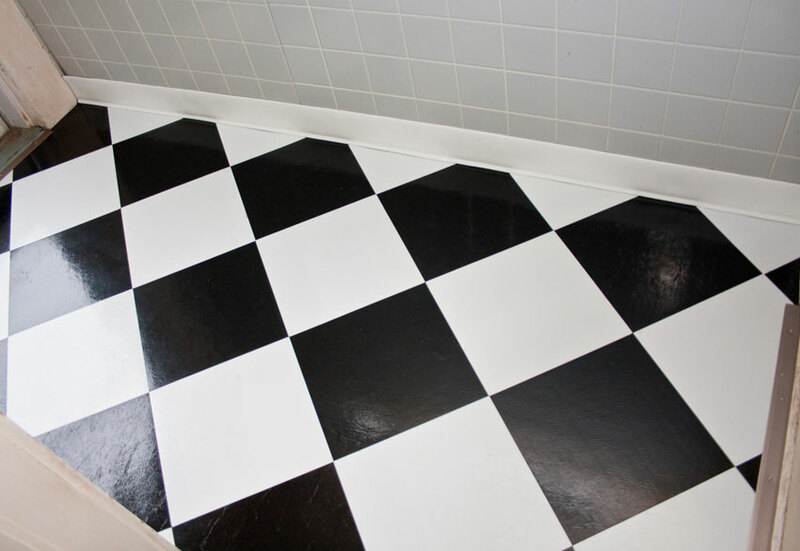 Plus, the owner even posted a black & white checkerboard tutorial video on YouTube explaining how to install the tiles easily. I have a feeling we’ll be ordering more tiles from them to give our bathrooms a quick floor fix as well. Anyway, back to the old floors! 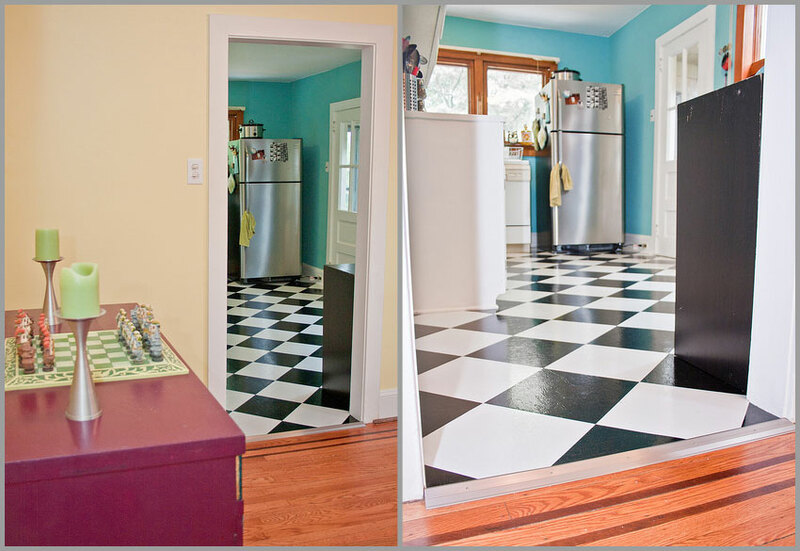 This is what our kitchen looked like when we had our initial walk through of the home. 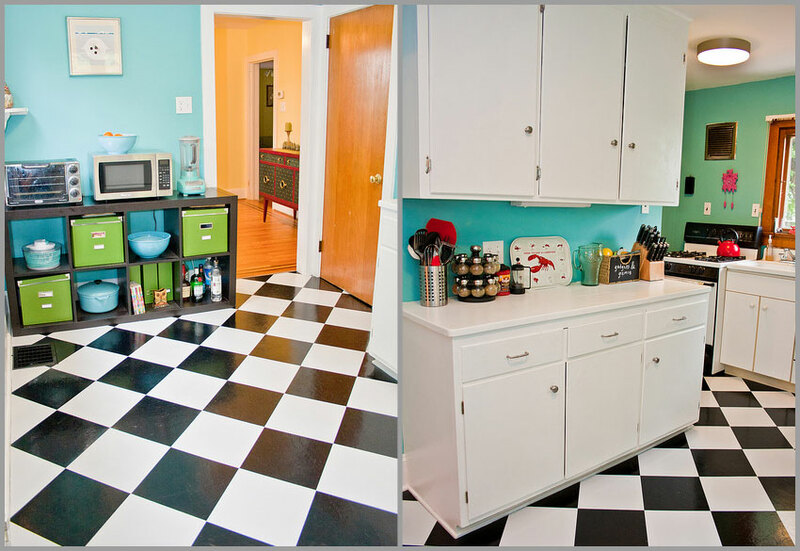 Here’s how the floors look now, with our bright blue walls and IKEA storage area. I really like peeking out to our other rooms and seeing the transition of colors. I definitely think the downstairs feels a lot more like “us” now. I am excited to do the same to our upstairs, which for the most part, hasn’t been touched since we moved in (eep!). The first thing we did was decide how we wanted to install the tiles on our floor. We were trying to figure out if we wanted to lay them diagonally or straight. We ended up choosing the diagonal route (left), which took a lot longer than it would have if we were working with straight lines, but I think it makes the room look wider. We began laying the tiles from the front, righthand corner and placed all of the whole tiles. Once we finished sticking all of the whole pieces to the floor, we had to start cutting out patterns to place the pieces which were touching the walls. It was incredibly difficult to cut pieces around vents, quarter round and door frames, but with some patience were were able to knock it out by Sunday afternoon. We both definitely had our fair share of dramatically flopping on the floor out of pure exhaustion and having sticky finger syndrome for 48 hours, but it wasn’t anything Goo Gone couldn’t help fix. 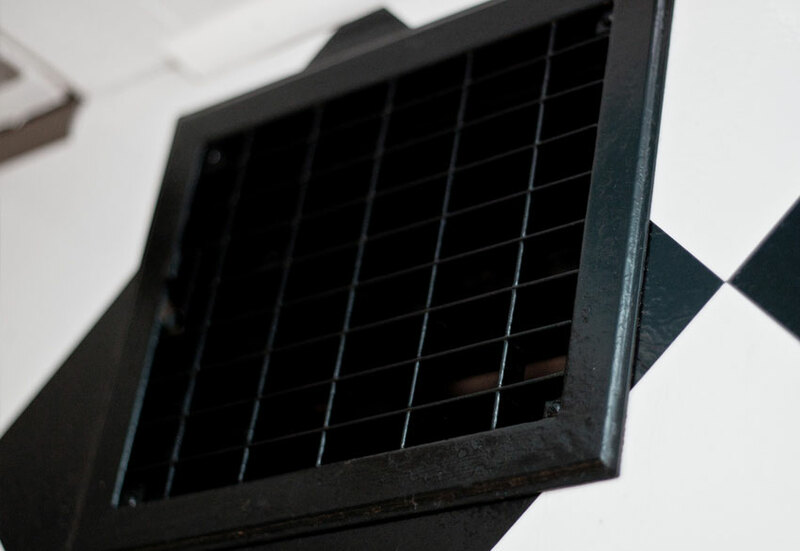 Our vents were the most frightening shade of brown I had ever seen (sorry for the lack of a “before” photo), so I sprayed them with black RustOleum. It’s surprising how much of a difference the black vents make in the room—everything looks a lot more clean and polished now. Here’s a view from our dining room, where you can see one example of the flashing (is that what it’s called?) in the doorway, which Pete replaced throughout the kitchen and mudroom. 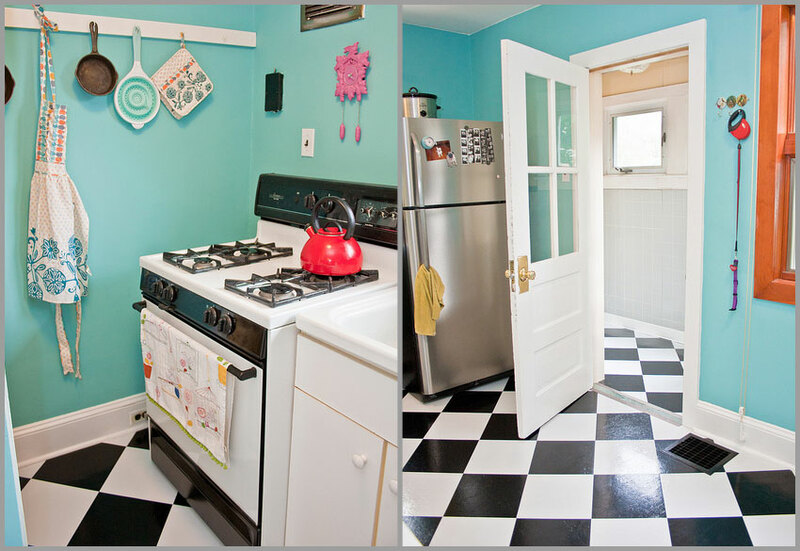 I really like the retro vibe of the kitchen and although it still needs some TLC (painting the door white, touching up the white in the mudroom, hanging airy curtains), I think it suits our personalities perfectly. Speaking of personalities, I am so happy that I am spending my life with this boyfriend of mine. We went through crazy mood swings together during these two days, which consisted of excited-exhausted-delirious-hot-and-bothered-starving-hopeful-proud-and-smelly. There’s nothing I enjoy more than singing songs together and inserting the words “Betty White” or “schloops.” We are both absolutely nutty and I couldn’t be more ecstatic to share our quirkiness together. That being said, I felt awful that Pete has to tolerate my obsessive, perfectionist tendencies. I’m a crazy person and insisted that we have the tiles line up perfectly where the kitchen meets the mudroom. Luckily for the ginger, I assigned myself to a large majority of the painfully difficult tiles, which resulted in a lot of grunting, throwing parchment paper pattern balls and occasional swearing on my part. The worst was trying to place tiles underneath the incredibly heavy oven, which cannot be moved out of the way due to its awkward placement. Runner up for the worst was trying to get tiles behind the fridge without cracking the tiles we had already placed in front of it. Here’s a view of our mudroom, which now has brand spanking new cove moulding at the bottom. 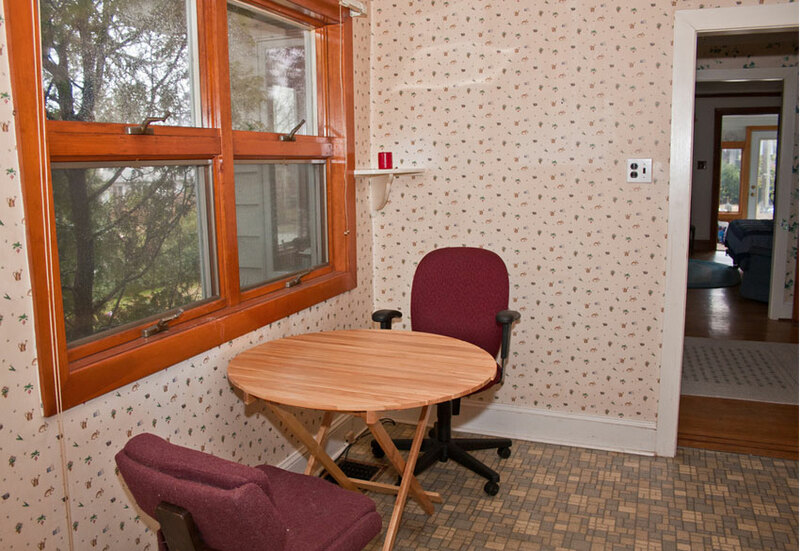 This is one of the many rooms on our neverending to-do list which needs major lovin’. The creepy door leading to nowhere looks like someone from a horror movie clawed at the trim for days. I definitely need to sand the window and door frames and give everything a nice coat of white paint, not to mention toss the previous owner’s little tree car freshener. Baby steps. 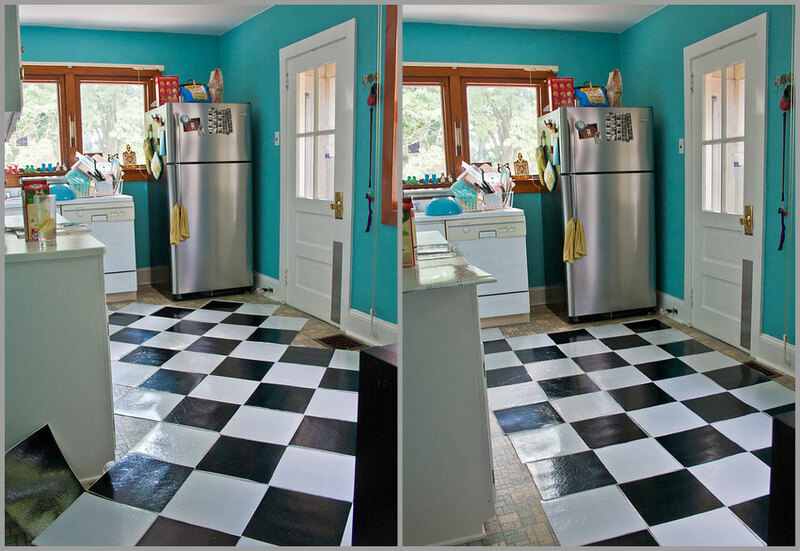 Has anyone else ever tackled a quick, affordable, DIY floor makeover? If so, how did it go (comment with photos if you have them! )?